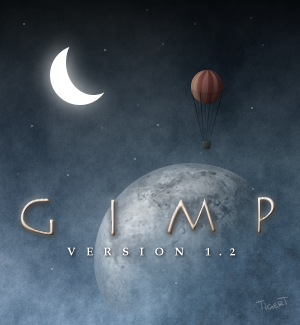 This topic (Gimp 2.8 Splash Screen) has been rated 4.4/5.0. It's looking like the sample splash screen on the overview page of the contest, nevertheless, yours is a nice splash screen. congratulations! This is the most professional looking one I've seen. The others are great, but some are too artsy. One gave me the creeps looking at it. (I think if I had to look at that every time I opened gimp, I would be inclined not to open it while alone! LOL!!). A couple were too dark. A couple of them were great, but when I opened them on the other monitor, the colors looked out of whack. This is the only one that looked great on either monitor, and still looked professional and not "cutesy". Of which there are tens of screens on the web. I like this one. Looks professional. It is true, this splash does not completely agree with all of the others, and is very derivative, but that is also what people and programmers are doing these days, it is the current 'look' (not totally shiny, but not bland either). Fourth and fifth were also nice. So it would be great if the new splash for GIMP would be in this line too. The most pro, without doubt, maybe to much? with such a splash you need a dark template to impress people. "GIMP work space" is elegant and understated - signifying the coming-of-age of the Gimp. Because of all the expected changes, this would be a fitting image change. The most professional looking one from all.